Form: Forked trunk with erect twiggy branches and whip-like twigs (P. subhirtella)..
Use: 'Okame' & 'Mazzard' Cherry are suitable to narrow planting medians. 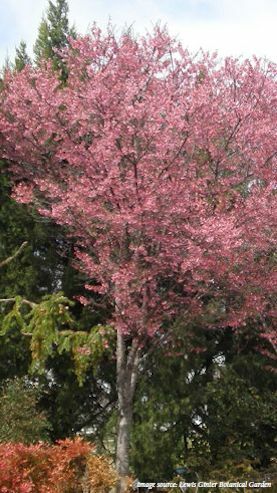 Lower branched Flowering Cherry & Plums effective single specimen or in groupings at Borough gateways. Limitations: Low branching height and spreading habit make its use as street tree limited. Short lived with many insect make this tree a difficult long-term investment.